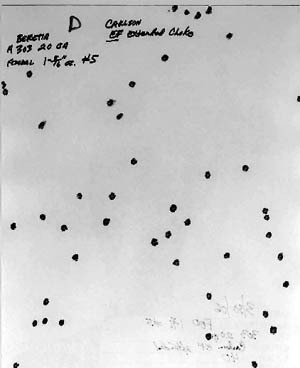 In the article, "Why We Desperately Need To Pattern Shotguns" on this site a few examples were given to show that downrange patterns are not always what we might think they would be, based on gauge, payload, and choke constriction. The "winner" of sorts in that article was "Pattern C." It was produced by a Beretta A303 20 gauge, factory Beretta 'full' choke, and one of my favorite 20 gauge loads, the Federal Premium "Mag-Shock"1-5/16 oz. 20 ga. 3 inch Turkey Load #GST258 (#5 shot). This was formerly sold as the Federal "Grand Slam Turkey" load, which is where the "GST" designation in the Federal load number comes from. There is little doubt that this load, as repeatedly patterned, is more than sufficient to take a turkey inside 40 yards. However, we can try to do better. And the logical way to do that is to change only one component at a time, and document the results of the change for better or worse. We now have a more consistent pattern at 40 yards with lethality above, below, to the left, and to the right of our turkey target, right off the bead. This pattern shown is not the "best" pattern shot, just representative of the ten pattern string. No matter what your pattern quality may be with factory hardware (the Beretta A303 being one of the better patterning 20 gauges I've owned with supplied factory tubes), we can almost always better it with a minimal amount of pattern work. The end result being cleaner kills, and more birds in the bag. And, we can cut down our ammo bill as well.